So who can give me info on this and what it is worth? I just purchased this and plan on using it on my bike...what does the little **** do on the shock?? Fox shocks a awesome! How much you pay? For the street not needed. For the track, its a must have. Value wise, I believe they cost $500 or more when new. 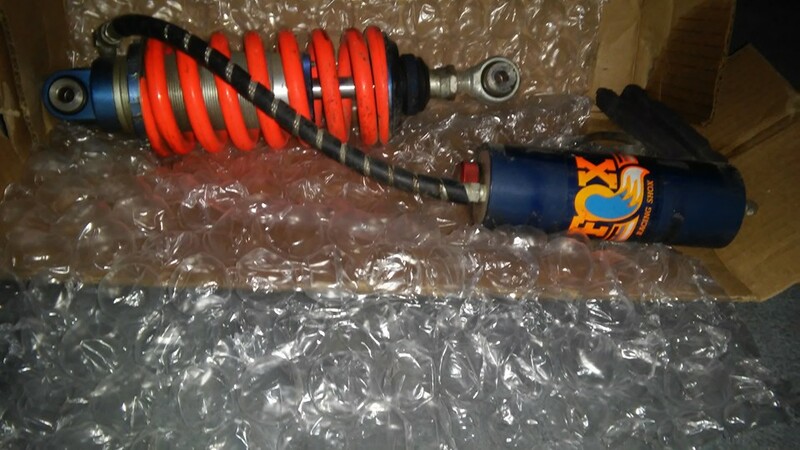 I got three Fox shocks and an Ohlins shock for my F2's. There was an Ohlins on ebay this morning for $300 something. Mine probably didnt need rebuilt but I had it done anyhow, just to be sure. It was around $150 for the rebuild, seals fluid, etc. and a spring for my weight. Daugherty Suspension did the job. Great guy, great service for a great price. I paid top dollar for my first Fox then had it rebuilt. My other 2 I got for an AWESOME price. I put one on my F2 way back in 1992. I did one track day with the stock suspension, installed the FoxShox then a month later did another track day. It made a world of difference in the stability of the bike and in my confidence to corner it a bit harder as now it felt like it was on rails. The little **** on the reservoir is compression. The ring around the bottom of the shaft is rebound. The big threaded thing next to the spring is preload and at the bottom where the mounting eyelet threads into, is a lock nut, that is your ride height adjustment. There is a "fox shock manual" here somewhere, search is your friend. I printed it out to take to the track with me. It tells you how to do the initial set up when installing the shock. All the links for the manual pdf are broke! Anyone here have a pdf?? ?